A LORRY driver would do well to pay more attention to his work, as he inadvertantly left his lorry's handbrake off and not in gear allowing it to reverse with its trailer into the Cam in Cambridge. Broadband contractors were busy by the river laying fibre cables when the lorry, complete with trailer rolled into the river, disappearing under the water, Alan Tilbury reports. The outfit sank just outside Magdalene Boat House, with much of its load floating down river. The lorry and its tralier were on the ramp by the boat house, when it started to roll into the water, catching another trailer on its way down, and taking it with it into the river with it all sinking. 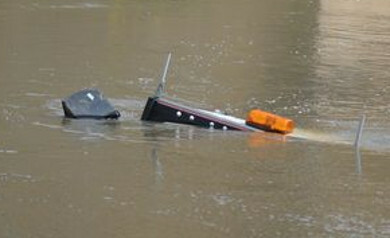 Mervin Rhodes' photograph shows all that can be seem of the lorry in the river.